Many homes with older fireplaces do not meet modern building codes. Most smoke chambers were built using the corbeling process, leaving a smoke chamber that resembles stairs or stepping stones. Due to the number of masonry joints in corbeled smoke chambers, however, they are more susceptible to deterioration when exposed to the heat from the fireplace over time. Because of this, it is recommended that people with corbeled smoke chambers in their homes have them parged. The parging process is intensive, and often involves removing bricks and the damper frame in order to create a smooth finish inside the smoke chamber. Depending on the age and condition of the chimney, the use of a spray-on system such as Smoktite may be recommended. Spray-on systems are much less time intrusive, yet can still create significant improvements in the safety and efficiency of your smoke chamber. Smoktite is designed to fill in any cracks or holes in your smoke chamber, creating a smoother and more even finish. 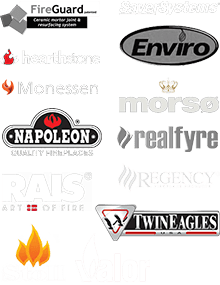 Because it is a ceramic-based product, Smoktite can withstand the heat of the smoke, gas and other products of combustion produced in the fireplace. Not only can it withstand temperatures as high as 3000 degrees Fahrenheit, but it also creates a protective barrier between your home and any corrosive or acidic deposits as well as moisture. What makes spray-on systems such as Smoktite unique is that they can be applied to the smoke chamber without the removal of any masonry. This saves your both time and money and helps keep the mess in your home to a minimum. While a spray-on system does not provide the same level of smoothness as having the smoke chamber parged, it can significantly improve chimney and fireplace function. The smoother surface of a smoke chamber sprayed with Smoktite allows hot air, gas and products of combustion to smoothly transition from the firebox to the flue. Likewise, it can also help strengthen your smoke chamber, protect against future chimney hazards and extend the life of your chimney system. If your corbeled smoke chamber needs to be parged, find out if the Smoktite spray-on system is right for your home.  Contact Olde Towne Chimney today at 812-284-0123 for more information on how Smoktite can improve your fireplace! A cast-in-place restoration process may be the right answer for your smoke chamber repairs and we can help with that, too!